Make no mistake, these are striped socks for true lovers of fine hosiery. Corgi socks have been made in the Welsh Amman valley for the last hundred years and trade under Royal Appointment to the Prince of Wales himself. 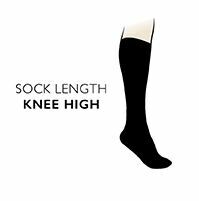 These Corgi Cashmere Cotton Stripe Knee High Socks are midweight socks, made from Cashmere and long staple Egyptian cotton. They have gently elasticated tops and have been traditionally made, including handlinked toes for smooth seams.